When it comes to compliance curricula, many colleges and universities have a firm basis in teaching rules and regulations. This is, of course, a crucial part of a comprehensive post-secondary compliance education. But it’s not the only one. With today’s rapidly changing regulatory landscape, training alone is not enough to prepare students to hit the ground running when they enter the corporate compliance industry. We need to prepare our students to be able to apply these regulations early in their careers. That includes arming them with the skills and capability to think through their actions, manage risk, and minimize negative outcomes on their organizations and communities. What I believe is missing from many college compliance curricula is a mentoring component — something that works closely with the compliance industry to prepare students for the world as it exists, and gives them the basis for developing their moral and ethical compass to apply to whatever compliance challenges they’ll face. The editors of Corporate Compliance Insights invited me to contribute an article detailing just this. It covers the roles that I believe academia, as well as the compliance community, should be playing to prepare our students to become the compliance leaders of tomorrow. Take a look at my approach, and let me know what you think in the comments here. Do you agree, or are you seeing things differently? 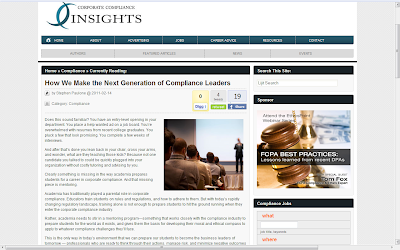 Thanks again to the Corporate Compliance Insights editors for taking my piece. Where do you stand on Facebooking with students?